Everything about the home was wonderful! The location right on the lake was fabulous and we had everything we needed about the home. I was up there for the Superior Trail races and this was a good location to stay. If we make it up for the race again, we will try and book the exact same home. 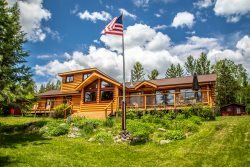 We loved everything about Sister's Cabin - the location close to Grand Marais and our favorite hiking trails, the very comfortable furniture - we're big readers and that matters, the great deck, close to the lake, easy access to the lake,the wood burning fireplace with wood provided. We would stay there again in a heart beat. My husband and I have been renting a cabin with you one weekend a month since April and this one has definitely become one of our favorites. The layout is perfect, the lot private and I really enjoyed the personal family history of the place. We have this cabin booked again in October and are really looking forward to it. We've stayed at Sister's Cabin several times and love it there. The location is gorgeous and the cabin very nice and comfortable. We really liked that the paths were better mowed/maintained than anytime we'd been there before, and the addition of the fire ring was also an improvement. Lots of hummingbirds at the feeder, too!